Last week, on July 21, my grandfather Mordechai Schusterman’s baby brother, Yosef, passed away. Before I share some thoughts about the aftermath of his death, and its relevance to all of us, let me tell you a bit about him (written by his granddaughter Larissa F.). Yosef Schusterman passed away after a long and arduous battle with Alzheimer's disease. He was a strong, brave, and charismatic man, defined by his unwavering strength of character and integrity, and renowned by all who knew him for his friendliness, his charm, and his generous, sociable nature. He was, up until his last few years (and even then! ), a charmer, a soldier, an entrepreneur, a fount of wisdom, a ladies' man, a man of unshakable conviction, a man of respect, a man of dignity. A man who would shine his shoes every morning, who exuded self-respect and integrity with every up-buttoned button, with every made bed, with every reprimand to his grandchildren to stand up straight, with every firm, sincere handshake that he would give (clasping your hand tightly and warmly both both hands). Most of all, he was a soldier. At the precocious age of 16, he took it upon himself to give his older sister the slip and fake his age in order to join the Soviet army - not because he was a fan of the Soviet regime (who had continuously persecuted his religious family), but because he wanted to fight Nazis. This set the tone for the rest of his life. He fought, and almost died, against Nazism, against the Soviet regime when he risked his life by transporting his wife and three children to Israel - not knowing whether he would succeed or end up in a gulag. He then had to face the untimely death of his wife to cancer, two heart attacks, two bypass surgeries, and then finally the horrendous affliction that is Alzheimer's Disease. He died whilst Hamas rockets were falling down on his neighborhood - even his departure was marked by fireworks in his wake. Clearly, he was a strong, principled and loving man. 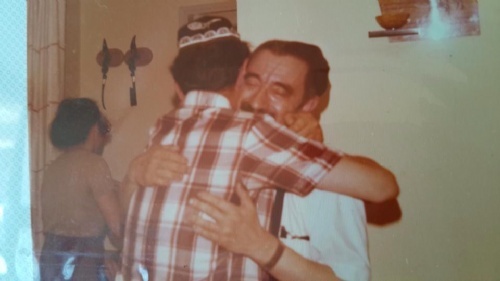 My grandfather spoke of him lovingly and this is a picture of one of their few joyous reunions after not seeing each other for 30 years. My Aunt Feige shared Yosef’s grandchildren’s email addresses for those who wanted to share condolences. These are my second cousins who I never met and I have never met their grandfather. However, we are family and I sent a condolence email. They were touched and we connected. It is like I’ve known them all my life (even though I wouldn’t recognize them on the street) and will for sure visit them on my next trip to Israel/Toronto/South Africa. It is the intrinsic family connection that no time or distance can erode. As the song goes- we are family! In the war in Israel, it is the same thing. We are all family of our brethren in the Holy Land. We all feel close and are doing what we can to help; a prayer or wrapping teffilin, Shabbat candles or up leveling our kosher. We had a section created on our website special for this operation. Check it out here, do a mitzvah, reconnect even if it’s been more than 30 years… do it because we are family. Thank G-d, Fraida and I are blessed with 3 wonderful children. Every so often, one of the girls comes crying that she got hurt, while the other one shouts out “it wasn’t me”. In Israel, we see something similar. While Hamas is solely responsible for the civilian deaths in the current war of self-defense, Israel is doing its best to minimize the civilian casualties. When terrorists are shooting with babies in their arms, what choice does Israel have? Israel is working hard to educate the world that “it wasn’t us”. In this week’s Torah portion it happens again: A person who inadvertently kills another must remain in the city of refuge until the death of the serving High Priest. The High Priest may say “It wasn’t me”, what does my death have to do with his freedom? To this we answer: The Jewish people are one family. As one of the leaders of the Jewish people, you should have prayed. You should have begged G-d that inadvertent deaths should not occur while you are the High Priest. While the High Priest did not kill and is on the opposite side of the spiritual ladder than the “inadvertent killer”, he should have done whatever he could to prevent it (in this situation, by praying). Therefore, he is considered somewhat of an accomplice in the crime and a level of atonement comes to the killer with his death. While Hamas is the killer, we as brothers and sisters of the those guarding our homeland, need to ask ourselves if there is something I can do to prevent the deaths of the soldiers and those held captive by their terrorist leaders. Can I do a mitzvah to help prevent it? Perhaps one of the 10 suggestions seen here? My wonderful children also need to ask “what could I have done to prevent the boo boo?”. With hopes that the holy soldiers guarding our homeland finish the job and keep all of Israel safe. Israel is still at war! Politically, Prime Minister Netanyahu has been referred to as hawkish, rigid and unyielding. At the same time, others refer to him as a man with the fortitude to stand strong in the face of adversity. All agree that he is strong and firm; the only question is whether it is a positive or a negative. In truth there are two types of being strong; reacting and responding. Reacting is being stubborn and unyielding, generally based on the latest fads and trends. Responding is a calculated decision based on one’s inner strength and convictions, not the whims of society. The tribes of the Jewish people are referred to as matot (in this week’s Torah portion) as well as shevatim (Genesis 49:28). Both these names are etymologically related to words that mean staff and rod respectively. A rod is flexible while a staff is firm and rigid. A rod is freshly cut (or still connected to the tree) and the life-giving nurture it received makes it flexible. A staff, by contrast, has been disconnected from its tree a long time ago, and has become dry and hard. When we recognize where we come from, when our connection to G-d is still noticeable, we can be flexible. Our inner strength and convictions are still “fresh” and flexibility cannot break us. At other times, when we feel disconnected from G-d and G-dliness, we are hard and firm. If we bend, we break. During those periods, we need to recognize that while we are currently a ‘mateh’, a staff, we were once a ‘shevet’, a rod, and we need to ensure that our stubbornness is rooted in our Torah based Jewish values. As masters of our own environments, we can shape it according to the Torah's values. To our brethren we say Chazak - Stand Strong! 1. Currently, there is a war going on in the holy land of Israel; our brothers and sisters are under attack. 2. A man gathers wood on the Shabbat, desecrating it, and is consequently put to death (Numbers Ch. 15). 3. A father has passed away and left daughters and no sons. The daughters lobbied to receive his portion in the Land of Israel (Numbers Ch. 27). 4. The masculine nature is to conquer, subjugate or overcome (Talmud Yevamot folio 65). Moses brought their case before G‑d. G‑d responds to Moses saying: “Tzelafchad’s daughters speak justly. You shall certainly give them a portion of inheritance…” G-d then established the law for all time by continuing: ”speak to the children of Israel saying: If a man dies and has no son, you shall transfer his inheritance to his daughter” (Numbers 27:1–8). Who was Tzelafchad? According to some opinions, he was the man who gathered the wood (mentioned above #2). Why did he desecrate the Shabbat publicly? If desecrating the Shabbat could cause him to be put to death, this would impress the importance of scrupulous Shabbat observance on his fellow Jews. Like their father who taught us the importance of Shabbat, the daughters of Tzelafchad showed us the significance of the land of Israel. This connects to the first thing on everyone’s minds these days: our brethren in Israel. Israel does not want to fight a war. They do not want lives lost. What Israel wants is to “elevate the world to recognize that true humanity is when we see our fellow as permeated and illuminated by the Divine image”. Tzelafchad put his life on the line for his fellow man, his daughters challenged authority to teach us the laws of inheritance, the IDF is doing whatever they can to keep Israel safe from barbaric terrorists and we need to uplift ourselves and our world to the service of true humanity, so that that every human is permeated and illuminated by the divine image. After hearing the recent news about the 3 teens being murdered in israel, the age old question brews again; "why do they hate us"? In this week's Parsha we read of the desire and efforts of Balak king of Moab and Bilaam the Prophet to curse the Jews. We also read of G-d's intervention that prevents them from succeeding in their endeavor. In this story we are given a hint to the answer to this question. In G-d's first communication with Bilaam, who is on his way to curse the Jewish nation, G-d says "don't go with them (officers of Balak), don't curse the people because they are blessed". It is clear from ancient times until present that the hatred directed towards us is not rational. We were hated when we had everything, we were hated when we had nothing. We were hated when we were on our land as we were hated when we were dispersed. We were hated when we acted religiously and we were hated when we tried to assimilate. Today too, modern day anti-Semitism, ie hatred of Israel, is evident in the disproportionate judgment of Israel for alleged crimes (which are not true). Many other countries, perpetrating these same ‘crimes’, are not held accountable or criticized for them while Israel is. This is evidence of the irrationality of anti-Semitism. The hatred towards us comes from the fact that we are blessed people. We represent a mirror to those around us for what G-d expects of them and the world. The Torah that was given to the Jewish people, and the essential relationship we have with Hashem, makes others around us uncomfortable. This is true when we are living that blessing. However, even when not, we still represent the royal family for which that blessing is doled out. One of the ways to break the hatred is to embrace the blessing that is ours. To be proud of our blessing and to live that blessing. If we can do that then we can have some effect on our surroundings; that they too should live a little more blessed and in turn uncover their own relationship with G-d. If we live that way, then just as as the story ends with Bilaam blessing the Jewish people with immense and powerful blessings, we too will receive blessings from those who presently wish the opposite. Sitting on Monday by the JLI conference, I heard the news that the bodies were found. 3 young kids who were brutally murdered. Almost instantly I thought what can I do. I posted a bunch on facebook, sharing etc. Then I remembered a story when there was a pogrom in israel and the Rebbe replies "By your continued building will you be comforted." Monday night was off to the Rebbe's gravesite with thousands of people getting a minute to pray for themselves and for others. 20 years thats a long time, but the message i kept hearing was that while it may be 20 years since the rebbe's passing, we must continue as chassidim of the Rebbe to continue to build, expand and reach out to anyone and everyone. Tuesday night, Rabbi Loschak the Chabad emissary in S. Barbara, California and the father of a good friend of mine passed on at the young age of 62. I am heading back to NY for the funeral. Rabbi Loschak recently told me that many people ask WHY, why me as well as why certain traditions. The example he gave was why woman wave their hands 3 times when they light Shabbat candles. He said based on his research the reason is because thats what we do - aka we don't know. Many times if someone doesn't know why they will come up with a story - but thats not where it's at. It's about doing more and through building we will be comforted. So it has been a tough week. How to deal with it? Build! Hope to see you on shabbos, have a restful holiday weekend.